This exciting club is in full swing and the variety of possibilities is inspiring! You should definitely plan to join us for this fun exploration into Marti Michell’s Perfect Patchwork templates. They are some of the best on the market! They have nibbled corners to help with alignment and accuracy. For just $5/month, payable annually, you can join the “From Marti and Me Club” and get EXCLUSIVE, limited edition “From Marti and Me” project patterns that use the Tool of the Month (some of which you may already own!). 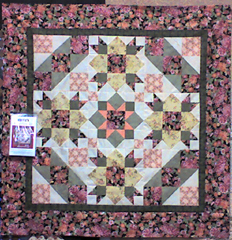 Generally, these projects will be wall hangings, table runners, etc., not full size quilts. The clear, well-written $7.50 patterns are FREE when you attend the monthly meeting. Registration is $60 per year. When you come to the Club Meeting, you’ll get your patterns ($90 value), a demo, and friendship. We’ll be doing lots of fun things like offering tool discounts, etc. From Marti and Me Club meets on Saturday mornings at 11 and it always follows Just Strips Club. Saturdays, 11 AM-1 PM: June 25, July 30, August 27, September 24, etc.